Izzy Swan might have a pretty cool YouTube channel if you’re interested in some DIY tips or wacky inventions – normally involving a power drill, but his latest creation really does go a bit far. 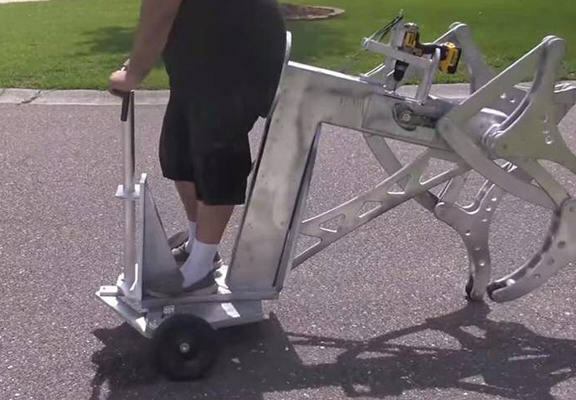 In news that will have his neighbours running for cover – or to get earplugs – he has invented a walking machine. Pretty good so far right? We’re all a bit lazy, so that sounds alright. But then you hear that the machine is powered by a drill. Yeah, that’s right. A drill. Those loud things that are guaranteed to wake you up from your Sunday morning snooze or just drown out the TV programme you’re watching. The machine is made purely out of wood, but at least the battery only lasts one mile, so the 20 volt drill that propels the machine – that can carry up to 370 pounds – won’t be too annoying for too long.